Beta has been argued, both conceptually as well as empirically. In 1960's, many practitioners used superior advantages in calculation attempted at CAPM theory for investing in asset which has high Beta. Many empirical researches on the later years refused the existence of security market line from CAPM. Afterwards, many practitioners and academicians stated the death of CAPM. Linear regression method could be used to make decision if it had already matched the criteria for Best Linear Unbiased Estimator. Prediction model is a statistic testing which aimsat knowing whether there is a relationship or effect between researched variables. Nonparametric method is an alternative action which is taken when the research model does not match normality assumption. This research, as shown by the use of weekly data, could be free from technical trading problems in predicted systematic risk. While ASII, HRUM, and TLKM stock returns are affected more by other factors. This condition has caused systematic risk not to affect significantly on those stocks. Another result has shown that banking stocks, which became part of LQ45, have higher systematic risk respectively. Bartholdy, J., dan P. Peare. 2001. The relative efficiency of beta estimates. Social Science Research Network. (March): 1-20. Bernstein, P. L. 1992. Capital ideas. Dalam Have we misinterpreted CAPM for 4 years? A Theoretical Proof. Fan, S.C. 2004. Social Science Research Network: 1-19. Brooks, C. 2008. Introductory Econometrics for Finance. Edisi ke Dua, New York: Cambridge University Press. Bursa Efek Indonesia. 2014. IDX LQ45 February 2014. Jakarta: BEI. Chan, L. K. C., Y. Hamao, dan J. Lakonishok. 1991. Fundamentals and stock returns in Japan. Dalam Have we Misinterpreted CAPM for 40 years? A Theoretical Proof. Fan, S.C. 2004. Social Science Research Network: 1-19. Fama, E. 1971. Efficient capital markets: A review of theory and empirical work. Dalam Have we Misinterpreted CAPM for 40 years? A Theoretical Proof. Fan, S.C. 2004. Social Science Research Network: 1-19. Fama, E.F., dan K. French. 1992. The cross section of expected stock returns. Dalam Have we Misinterpreted CAPM for 40 years? A Theoretical Proof. Fan, S.C. 2004. Have we Misinterpreted CAPM for 40 years? A Theoretical Proof.Social Science Research Network. (September): 1-19. Fama, E. F., dan K. R. French. 2003. The capital asset pricing model: Theory and evidence. CRSP Working Paper No. 550. Tuck Business School Working Paper No. 03-26 (August): 1-35. Universitas Gadjah Mada, Pidato Pengukuhan Jabatan Guru Besar Fakultas Ekonomi. 2003. Risiko Sistematik (Beta):Berbagai Isu Pengestimasian danKeterterapannya dalam Penelitian Empirik. Tandelilin, E. Yogyakarta: UGM. Hartono, J. 2009. Teori Portofolio dan Analisis Investasi. Edisi ke Enam. Yogyakarta: BPFE. Fan, S. C. 2004. Have we misinterpreted CAPM for 40 years? A Theoretical Proof. Social Science Research Network. (September): 1-19. Fama, E.F., L. Fisher, M. Jensen, dan R. Roll. 1969. The adjustment of stock prices to new information. Dalam Have we Misinterpreted CAPM for 40 years? A Theoretical Proof. Fan, S.C. 2004. Social Science Research Network. (September): 1-19. Ghozali, I. 2008. Structural Equation Modelling Metoda Alternatif dengan Partial Least Square. Edisi ke Dua, Semarang: Badan Penerbit Universitas Diponegoro. Hartono, J. 2004. Metodologi Penelitian Bisnis: Salah Kaprah dan Pengalaman-pengalaman. Edisi ke Satu, Yogyakarta: BPFE. Hartono, J., dan W. Abdillah. 2009. Konsep & Aplikasi Partial Least Square untuk Penelitian Empiris. Edisi ke Satu, Yogyakarta: BPFE. Lo, A., dan A. C. Mackinlay. 1988. Stock market prices do not follow random walk: Evidence from simple specification tests. Dalam Benarkah Pasar Modal Kita Efisien? Bukti dari Jakarta Stock Exchange. Utomo, D., dan Fuad. 2008. 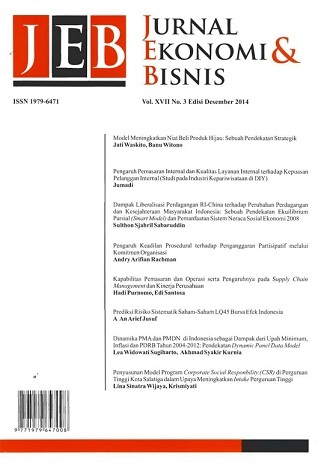 Jurnal Keuangan dan Perbankan.Vol.12 No.1(Agustus): 43-55. Malkiel, B. G. 1990. A random walk down wall street. Dalam Have we Misinterpreted CAPM for 40 years? A Theoretical Proof. Fan, S.C. 2004. Social Science Research Network. (September): 1-19. Manurung. A. H. 1996. Asset pricing model on the jakarta stock exchange: A nonparametric analysis. Dalam Bunga Rampai Kajian Teori Keuangan. 2002. Disunting oleh S. Husnan, E. Tandelilin, M. Asri, dan M.M. Hanafi. Yogyakarta: BPFE. Pasaribu, R.B.F. 2009. Non-synchronous trading in Indonesia stock exchange. Journal of Economics and Business. Vol. 3 No.2(July): 81-89.